Can you believe that Christmas is only days away? I have so much to do and so little time. It’s a little hard to get into the Christmas spirit here in Dallas when the weather is still quite warm. I was excited to head to New York over a week ago to experience some winter weather. Well, was I in for a surprise when the high was 60 degrees during the time we were there! It was still a little chilly, but perfect weather to layer with fur vests, knee boots and parka jackets. I love layering because you can take off or add on and still be warm, as well as comfortable. I also find its better to carry a smaller bag when layering outfits so that you’re not adding on any additional bulk. 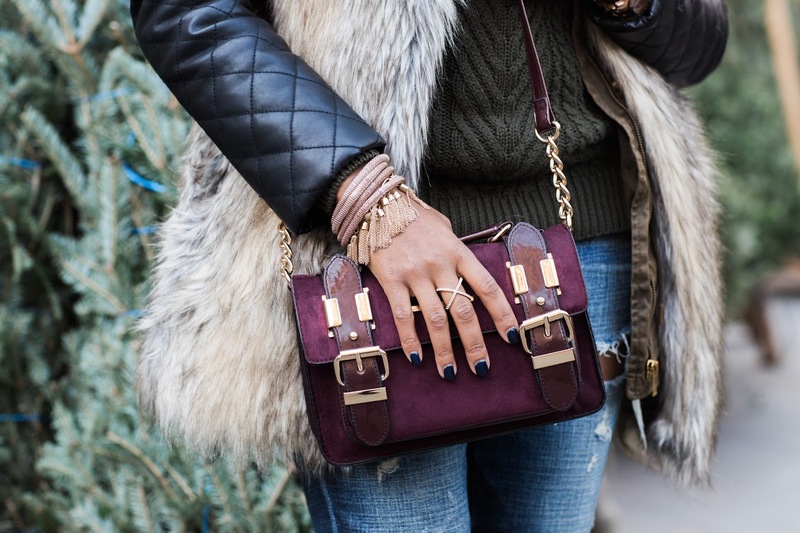 This merlot, suede cross body bag was the perfect companion for touring the city. It holds so much and is so easy to throw on and go! I wore it as a cross body and as a clutch for night time attire as well. I promise to fill you in on more details about my trip to New York very soon! As I said earlier, I have so much to do to prepare for Christmas. So I better let you go and jump on my Christmas shopping ASAP! See you Tuesday for my last Girlfriends Guide to Gift Giving post. I have a few gift ideas for the Foodie in mind!! great options here in black, brown and in red! Leather Sleeve parka- Zara (old) similar in green, and tan! Boots- JustFab (old) similar in burgundy and obsessed with these!